Multi Split Air Conditioning systems with inverter technology provide a good way to save space, buying cost and electricity cost in smaller offices. 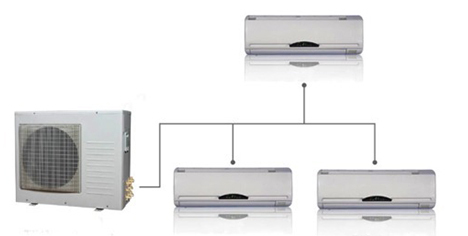 These air conditioners have multiple indoor units connected with a single outdoor unit as shown in the picture below. The temperature control is available at every indoor unit and the outdoor unit adjusts the compressor load based on the heat load coming in from various units. It saves space: as there is only one outdoor unit instead of many. It saves buying cost: The combined cost of buying several single split units is more than buying one single multi split unit. It saves electricity cost: The compressor load is adjusted based on the heat load coming in from various indoor units by the investor technology ; therefore electricity consumption is less. These systems are available in sizes of 2 ton and more with 2 to 8 units connected with single outdoor unit. Smaller units can also be used for residential purposes in case air conditioning is required in multiple rooms. Call us for service / maintenance & also the AMC services.